This album, apparently, is presented as some sort of Erroll Garner parody. I found this note as part of a 2009 review for an Erroll Garner DVD set that this album is a parody of Erroll Garner's Concert By The Sea - 1956. "It was so well-known that one small label released an entire-album parody of it by a pianist named Morris Garner, which even included the sounds when during that live concert Garner accidently knocked his ashtray off the piano and burned himself." This album was also mentioned in a January 16, 1961 Billboard article promoting a new jazz set referred to as "J.U.N.K. "It is alleged to have been recorded at a most controversial concert presented by Morris Grants. On the bill at said concert were the likes of Morris Davis, playing trumpet, and pianist Morris Brewbeck and his quartet. It is also understood that the mind behind the recording is the same mind that created the Worst of Morris Garner. On this date he plays most, if not all, of the featured instruments." From the back cover: Born in Boston at an early age, Morris began playing the piano when he was sixteen. As with other jazz greats, Morris was self-taught. 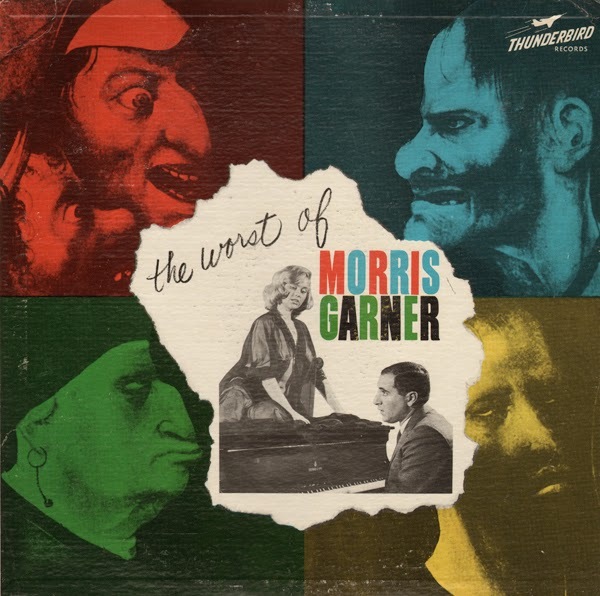 Though at first his style may sound faintly similar to another piano star, Morris' understanding and grasp of his music is unlike that of anyone alive. Utilizing an amazing technique of playing, Morris has made obsolete "chords" and "rhythm" as we know them today. This new, happy spirit in sound will forever put Morris Garner in a permanent home. For three years Morris experimented with this new style of playing, constantly driving himself to perfect new ideas with rhythm and sound. When he was 21, he gave his first performance at a small club in Boston's Back Bay area. Only 7 people were there, but they say history was made. When he was 24, Morris began playing at Richie's House, a jazz hangout for all great musicians whenever they appeared in town. One night a jealous musician clobbered Morris from behind with a bass fiddle which forced him to retire temporarily from the jazz scene. Weep No More, My Robot/ Another Garner original designed to make everyone aware of the coming Space Age. His fantastic groping into the unknown certainly reflects itself here.